This is the latest offering from the Dardenne brothers from Belgium. 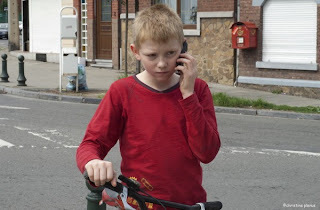 The story is about a ten-year old boy named Cyril in a sleepy Belgian town. Cyril is abandoned by his father and is currently in a government child care center. The opening scene captures the central plot of the film where the viewer is introduced to Cyril who vainly attempts an escape from the child care center. In the background we hear the chorus of children playing. The opening scene pretty much establishes the essential mood of the film - Cyril is unlike a typical ten-year old boy. While children of his age find pleasure in simple things, Cyril encounters complex relational issues like love, parental acceptance and support, and broadly trying to find social acceptance at a tender age. He intends to undertake a fanatic search for his father and his estranged bike - a symbol of love of his father for him. Cyril is fully aware of his condition and is filled with anger and strong determination to face the reality. Cyril embarks on a journey to find his father in which he has two loyal companions: his old bike and Samantha, a kindhearted hair-dresser whose unconditional love and sympathy for Cyril is never explained in the film. And the camera follows Cyril's journey incessantly. Few minutes into the film and Cyril finds out that his father is unwilling to entertain any connection with him. Then the directors create an assortment of contrivances to underscore the contrasting options a boy in Cyril's situation would face. Cyril's inner struggle to accept the truth and his helplessness - all that a ten-year old orphan is likely to face in his journey - are presented through these events. In a matter of few days, we observe that Cyril's understanding of his position in the society belies his age. He grows faster than the children of his age. He discovers this grand truth in a thrilling climax that skillfully establishes his marginal existence in the society. The film follows a strong narrative style. Camerawork is simple and dedicatedly focused on the boy's character. The camera hardly leaves his character. In this sense, the film is reminiscent of Abbas Kiarostami's Where is the Friends Home and Jean Truffoant's The 400 Blows. The essential difference between this film and the later is that unlike Antoine (the 12-year old boy), Cyril has a place to go. He is not frozen in time. He is not left behind. He makes it to the defined boundaries of the society, albeit in a marginal way. The distinctive feature of the film lies in its use of music. Each time Cyril undergoes a strong emotion of rejection, the music is used to accentuate his pain and the directors never use imagery to manipulate the viewer's feeling toward Cyril's character - a common emotional trap for such a film that very few directors can avoid. Overall the film has a honest feeling to it; the plot has a universal appeal; and depicts a tumultuous personal journey of a young boy in search of social acceptance. 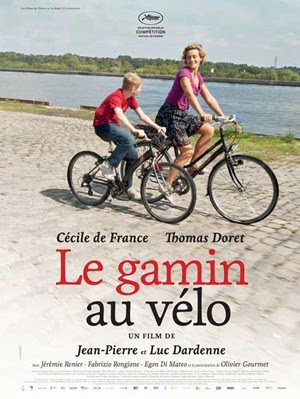 The Film won a Grand Prize of the Jury at the 2011 Cannes Film Festival.